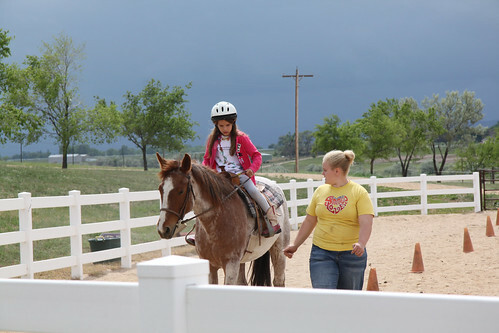 For our troops year end event I was able to throw together a horse clinic for our girls at a local spot, Sun Pony Ranch. First off, this ranch was awesome. They were so accommodating to our girls. They had the whole event down to a science and really showed the girls a great time. I would highly recommend them to anyone looking for a ranch experience. I know our troop will be back. We started the day off with lunch together on the hay bales. 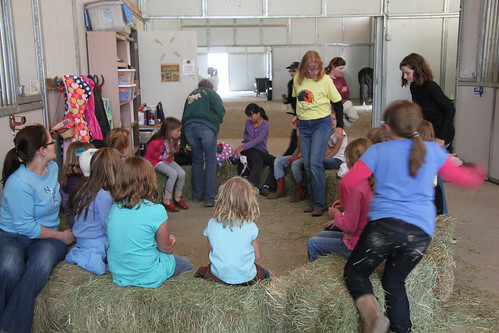 Afterwards, we all sat around for our horse safety talk. Of course Sydney was dressed all ready to go for her time at the ranch. Cowboy hat and boots and all. I actually learned a lot myself. 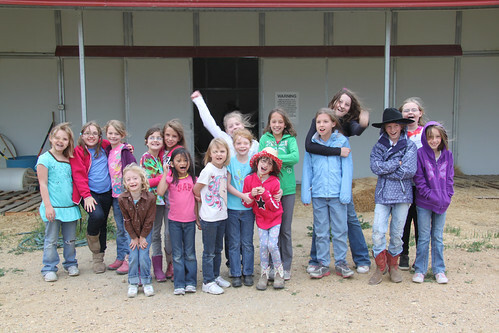 The girls were then broken into groups of 2-3 girls per horse. 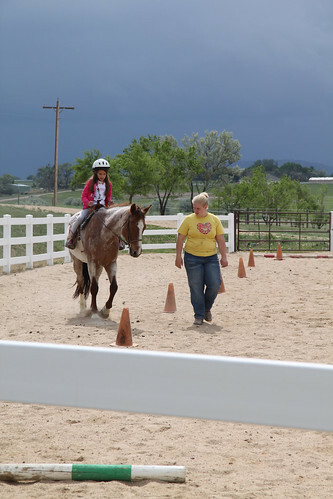 The teams consisted of two older girls who would have their very own 30 minute riding lesson. And one younger girl who was too young to ride but would have extra grooming and care time while the others rode. 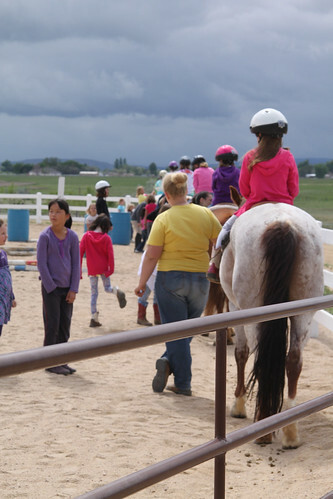 They learned how to bridle the horse and prepare to ride. 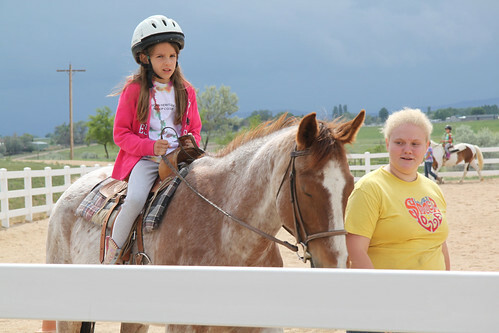 While the first group had their riding lesson the other group learned how to groom and feed their horse. All very well organized. 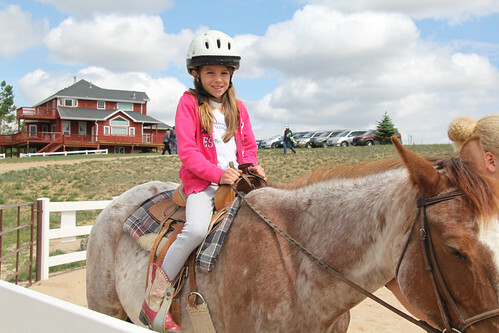 Sydney was in the group which rode first. 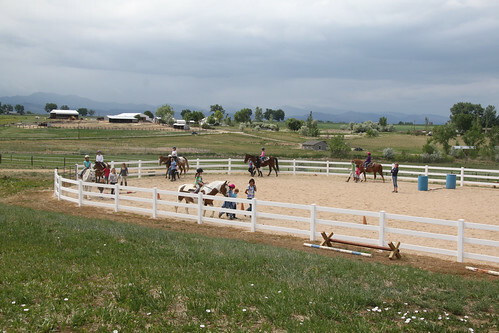 The ranch had this nice riding ring was which all prepped and ready for the lesson. 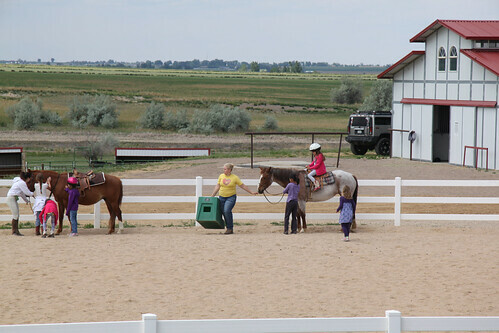 Each time around the girls would line up along the side and listen to the instructions for this rounds lesson. 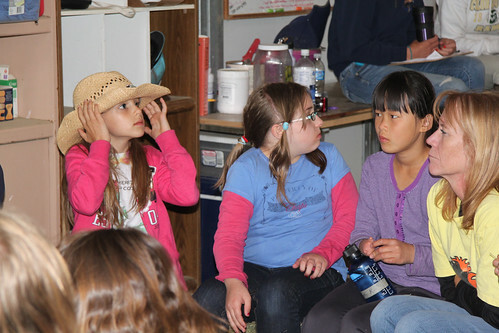 Each girl had her own camp counselor there to assist her. But, the rider was responsible for guiding her own horse. They learned the proper way to hold the reigns and guide the horse where they needed to go. The girls each took a turn guiding their horse around these rings. All did a great job. Sydney was especially deep in concentration during this task. They even had a couple rounds of trotting. Sydney loved this especially but thought it was “bumpy.” Surprised? Good to see that Sydney took this whole thing so seriously. But had fun at the same time. After the riding lesson it was Sydney’s turn to groom and care for the horse. 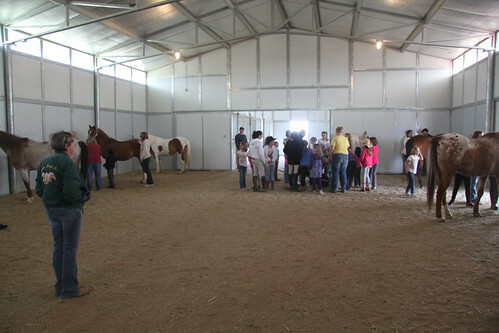 They had this great barn for this part of the clinic. 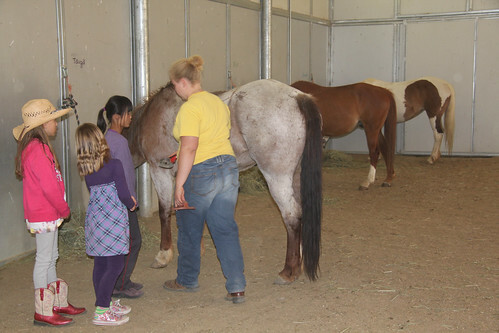 Again the kids were broken into very small groups as they cared for the horse. They fed them, brushed them, picked out mats, and even made time for some good ole fashioned petting. It was at about this time that we realized just how much Sydney takes after her Mom. We both love horses. Yet, we are both very allergic to horses. Mom came prepared for the allergies with meds. However, we didn’t expect the same reaction from Sydney. She has always been fine on horse rides. It wasn’t until she was really grooming and picking at the fur that the allergies struck and her eyes immediately started to itch and swell. We stopped for one final group shot before running to the car to get her home as she was starting to panic. I was able to snap one photo in the car of the early stages of swelling but I was banned from any photos as it got worse. Poor kid. 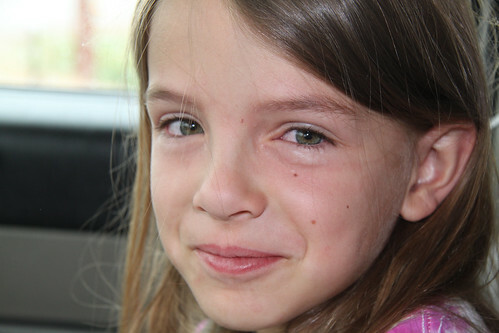 She really, really wants to do horse camp this summer but not sure how she’ll react. Is she okay with some Allegra beforehand? Or is that enough? Still thinking that one over. I think all the girls had a really great time. I know I did. I was later asked to be the special events coordinator for our troop next year so I must have thrown together some good events this year. Happy to hear. If the girls enjoy it, then so do I.